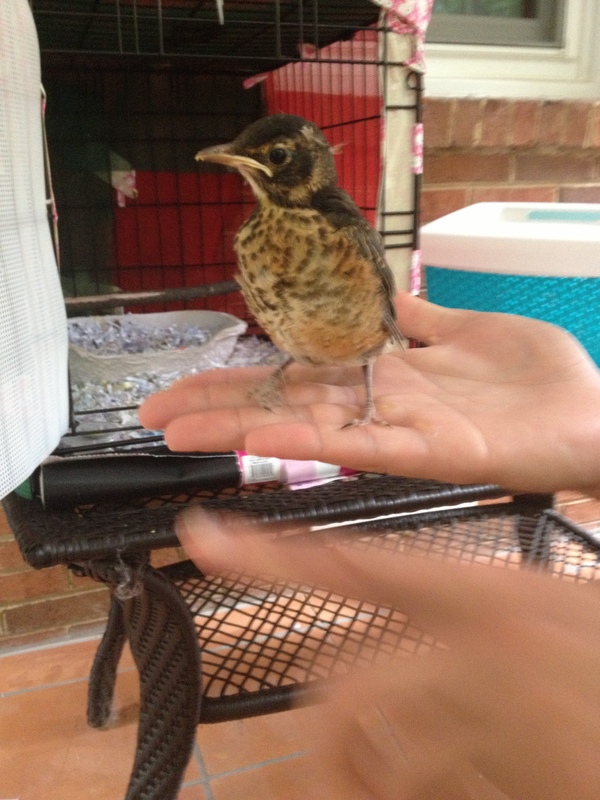 Over the summer, my mom rescued a baby bird that she found wandering in her driveway. We couldn’t find a nest that it might have dropped out of, and it wasn’t ready to fly yet, so we decided to take care of it. Thankfully, the bird wasn’t injured by its fall and was old enough to have its eyes open. Covered in tufts of fluffy feathers, Peep (as we named it) needed a little TLC. The Georgia heat and untold hours or days without food and water had left her dehydrated and weak. She could barely tweet. After a day in a breathable plastic storage bin, I decided that Peep should have a better cage. I took an old dog crate that Biscuit had outgrown, retrofitted it with plastic mesh over the metal frame and added a perch. Mom contributed paper shreddings (perfect for bedding material). 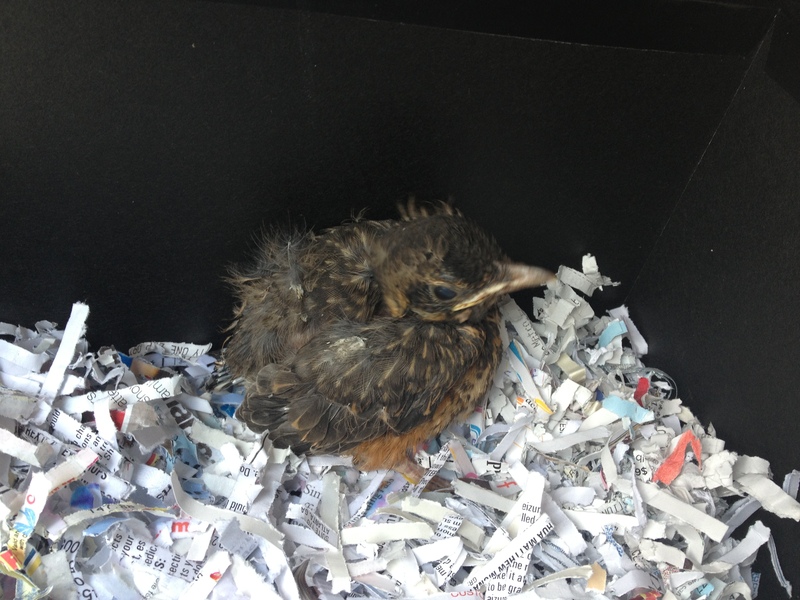 I found a website that gave care tips for foundling birds. They recommended a diet of hard-boiled eggs, mealworms and tiny kitten kibble. (FYI: PetSmart carries fantastic canned mealworms in their reptile section. You refrigerate them after opening. They stay fresh and edible.) We fed Peep about every 2-3 hours during the day and then just before bedtime and first thing in the morning. Within a few days, she was eating almost a can of worms a day! 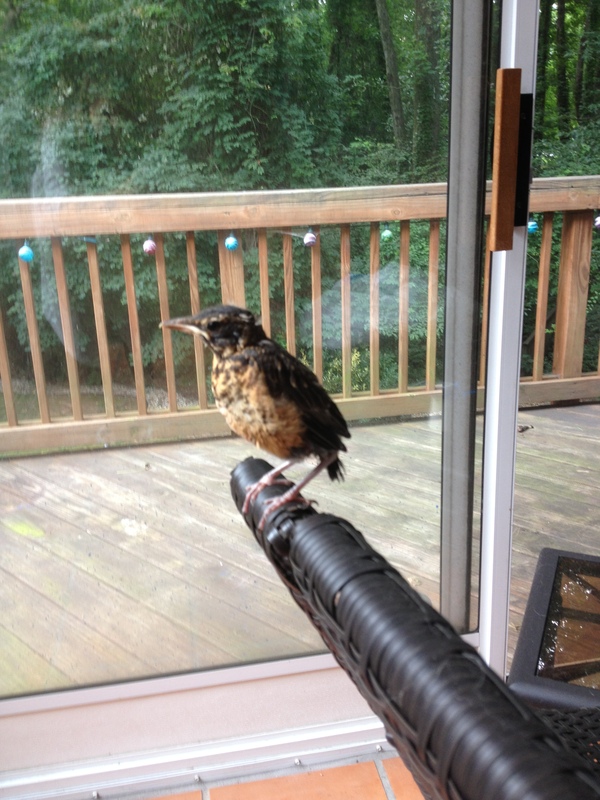 She’d flap around the sunroom, perching on furniture, or my shoulder, gaining strength and confidence. Patrick even enjoyed feeding her (he got over his disgust for the worms)! He’s got a great way with animals. We’re fairly sure that Peep was a female robin. She didn’t have the red breast, but looked like a robin. A little over a week, we took her to my parents house, where she had originally fallen from the sky, and released her into a Japanese Maple tree. She fluttered to a high branch and then took off for parts unknown. It made me so happy to see her thrive under our care and then fly off. A little sad too, but I know she would have perished without us. 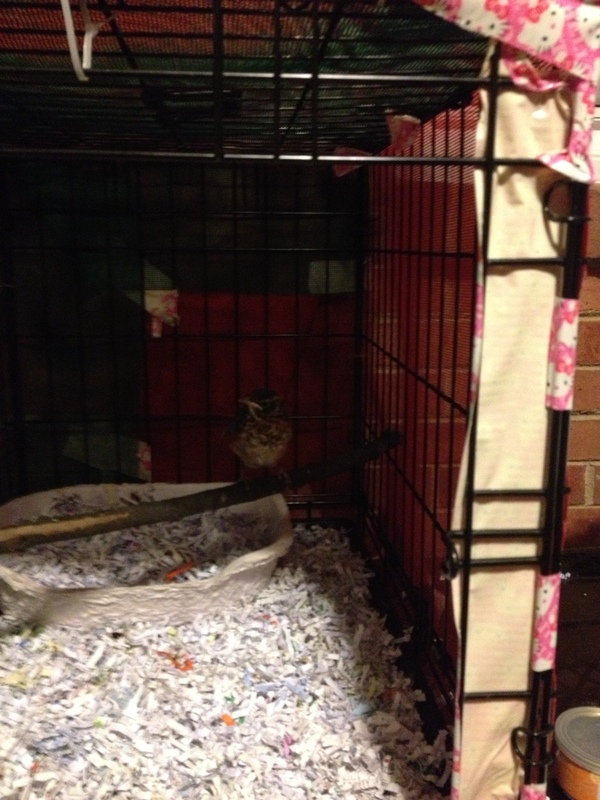 This entry was posted in Birds and tagged Bird, peep, rescue, robin. Bookmark the permalink.